The caravan was initially bought by Lennon as a gift for his son Julian’s fourth birthday. He hired the pop art designing trio from Amsterdam who called themselves ‘The Fool’ to paint his son’s extravagant present with the famous Sgt Pepper motif and the art designs that were so popular amongst travelers at that time. Lennon also had “The Fool” paint his Rolls Royce in a Sgt Pepper era motif. In 1967 John bought a small 21-acre island called Dorinish. He at first planned to build a house on it but never did. He did stay at the island some and had the caravan floated out to it for a while. Through the years he would take the caravan out some. After John was murdered, Ringo Starr took ownership as part of the late Beatles estate. 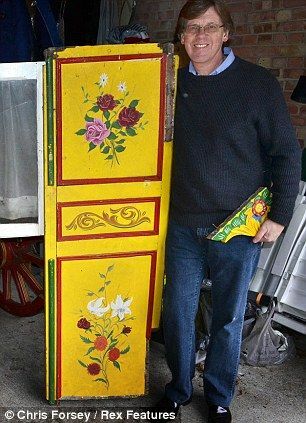 In 1982, he called in Cookham-based vintage caravan restorer John Pockett to restore it. In September 1983 it was restored to its former glory from Mr. Pockett’s Cookham workshop and was placed beside Ringo’s swimming pool. In 2013 it was found at Ringo Starr’s former Surrey home under a tarp. A charitable trust, the Ascot Lawyers Foundation, has taken ownership of the piece of Sgt Pepper memorabilia. They working on restoring it. I wonder if that Rolls Royce is still painted like that now or did they paint it over? I think John had it painted White afterward but they have painted it again just like it was…it’s in a musuem I think. fascinating, bordering on surreal. so much for his son inheriting it!